Many businesses are started from the owner’s kitchen, spare room, or possibly their garden shed. However, there comes a time for most business when they consider moving into their own office space. When working from home it can be difficult to separate work and family life and to switch off from work. A separate office can help to solve this problem because it clearly defines work time when you ‘re in the office and family time where you’re at home. The journey to the office also gives the business owner time to think. 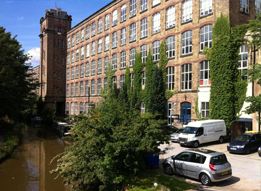 When your business has its own professional Macclesfield office space it makes your business appear more professional, established and successful which can lead to more customers, partners and profits. A professional business address on your website and stationary will give a positive impression of your company. Having your own office space also allows you to invite customers and prospects in for meetings to close sales and strengthen relationships. There can be numerous health and safety issues with employing staff in your home, not to mention the probable lack of space. When it comes to employing staff, many business choose to take on office space in order to give their employees a base to work from. As a very rough guide you should allow around 100 sq ft per person. However, this varies depending on the type of business you run and whether the office space is all work space or whether it includes meeting rooms etc. Many business take on workshops and storage facilities as well as office space. Even if you’re not a retailer or wholesaler your may still need to hold stock for your own usage. For example, a carpenter may need to hold stocks of wood. Many businesses also need workshop facilities in order to house their equipment such as sign makers and printers. 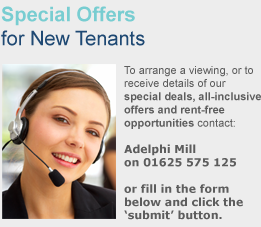 Whatever your reasons for wanting your own office space in Macclesfield – Adelphi Mill Properties can help make the transition smooth and pain-free. In the next Blog post we’ll be looking at the most important things to consider when leasing office space in Macclesfield.